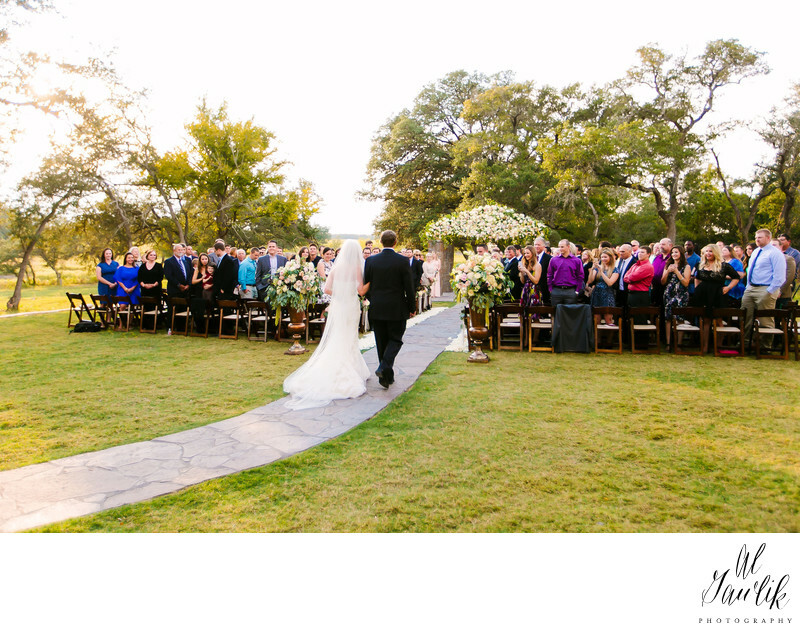 French style venue in the heart of the Texas wine country offers a vision of charm and romance for all couples. The Ma Maison—French for “My House”—is a venue that focuses on the French heritage of class, elegance and customer service. Located in Dripping Springs, Texas, Ma Maison accomplishes just that! Dripping Springs is a small but popular town owning to the beautiful scenery the Texas Hill Country is world famous for. The Texas Hill Country spans for many hundreds of miles, but Dripping Springs, also known as a “Gateway to the Hill Country” is conveniently located only half an hour west of Austin, Texas. Ma Maison sits on 23 pristine acres in the wine country and is often likened to the environs of Napa Valley. The hosts of Ma Maison have years of experience in holding events, most especially weddings, and they strive to impress. The premises has number of indoor and outdoor facilities, boasting a 10,000 square foot site that overlooks the enchanting lake view over Lac Moise, a perfect backdrop for group photos. There is room for all of your loved ones, their loved ones and more as the Ma Maison can comfortably sit over 600 people! There is ample room and the buildings are well suited for buffet style meals and dancing as your celebrate your special day. The facilities include a beautiful 4000 square foot hall constructed of open wood beams complete with a fireplace and crystal chandelier that would make a memorable addition to your romantic photos. There are accommodations for both indoor and outdoor ceremonies, and you can look forward to capturing timeless snap shots of family and friends as they enjoy food and company on the spacious balcony. There is plenty of room for fun, activities or just relaxing. Patrons can quickly spot a gorgeous reclaimed antique French Gazebo while meeting new people and catching up with old acquaintances in style and comfort. There are private gardens for ceremony preparation that offer an ideal locale for intimate portraits for the bride and groom, From holding ceremonies in The Grove, an outdoor grove of like oaks, to holding receptions in the appealing expanse of The Trellis you are sure to find everything you are looking for!